Mini cookies and cream cheesecakes featuring a rich chocolate crust, a classic cheesecake layer with cookie pieces throughout and topped off with homemade sweetened whipped cream and a mini Oreo cookie. This week has been weird, in a totally – okay mostly – good way! Because let’s not forget the shattered glass and bird food everywhere. Monday we spent easily 3 plus hours outside in the pool. It was so much fun. We’ve never spent that much time out there as a family. At least not that I remember. Little kids get tired of it fast. And parents of little kids get sick of it fast because you’re always floating around with a baby or monitoring. Once they’re bigger, it’s easier and way more fun. The girls can touch the bottom and our oldest is now attempting to learn to swim on her own. I bought paddle boards or whatever you want to call them but the girls can’t seem to figure them out. Instead, they like holding onto a float and kicking around. Hey, whatever works! And then there’s lil man… he’s totally content just floating around. We had so much fun that we did it all again yesterday, only for not quite as long because we went out later. But on top of having another fun swim day, totally soaking up summer and sun – my oldest got her first pair of sneakers with laces. I mean it’s kind of epic in kid world. I don’t remember my first pair, but she loves hers. But wait… here’s the kicker. I showed her for maybe 1-2 minutes how to tie them – tops! She’s already got it down! She’s over the moon excited and proud of herself and obviously we’re pretty proud of her too. I didn’t expect her to pick it up so quick! If only everything were that easy! 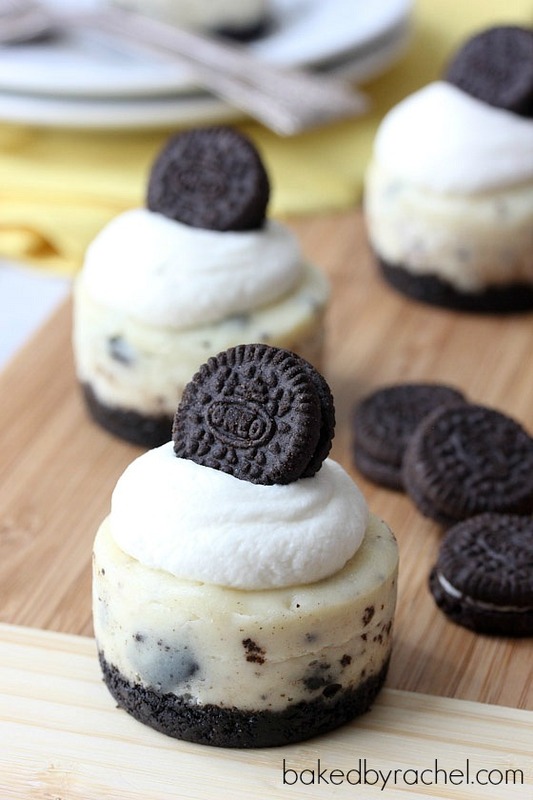 Like these cheesecakes. Clearly I love making them. They’re fun and cute. Bite sized treats for any and all occasions. The day ends in y – totally a celebration. The sun came out – another reason to celebrate. Wait… it’s a birthday, holiday, weekend, etc etc – totally a reason to celebrate with bite sized cheesecakes! Okay, they’re really 2-3 bite but you get the idea. You don’t need a plate for them. But you’ll probably want one because you won’t want to just eat one of these babies. 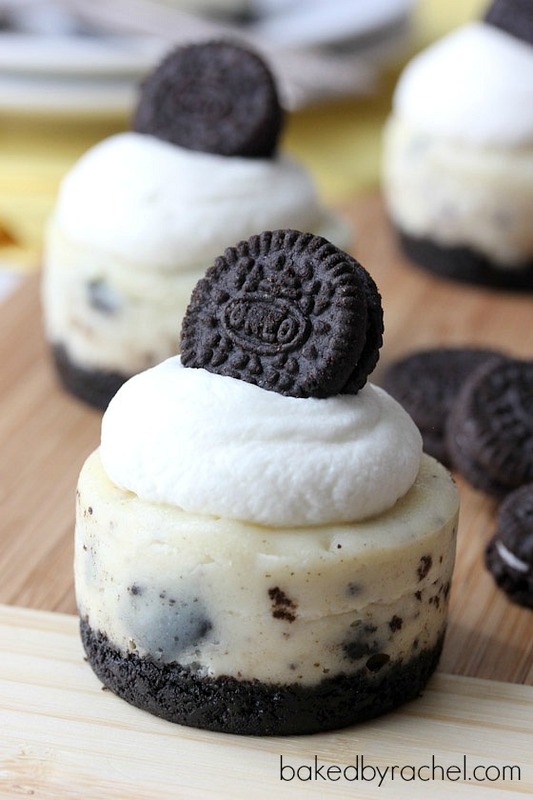 These adorable cheesecakes feature rich chocolatey crust, a traditional cheesecake filling with cookie bits throughout and finished off with homemade sweetened whipped cream and mini Oreo cheesecakes. Seriously. The. Best. 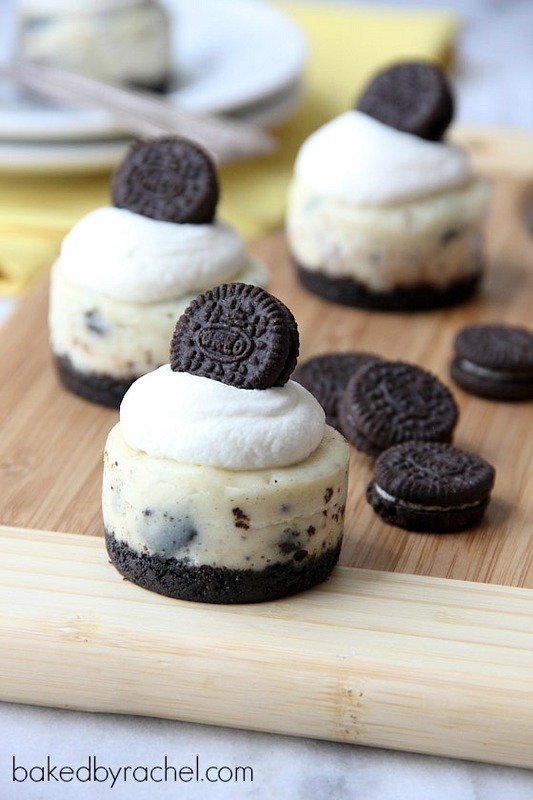 If you love Oreos or cheesecake – you’ll be in heaven with these. 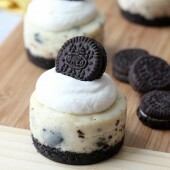 Go buy yourself a mini cheesecake pan HERE and whip these up! Bite sized cookies and cream cheesecakes topped off with homemade sweetened whipped cream and a mini Oreo cookie. Preheat oven to 350 degrees. Lightly grease a mini cheesecake pan. Set aside. Blend 10 cookies until only fine crumbs remain. Add butter, mix well. Divide among prepared cheesecake cavities, using one small cookie scoop each. Press down to create a flat crust. Bake for 5 minutes. In a large bowl or stand mixer, beat cream cheese with sugar until smooth. Add in vanilla, cookie pieces and egg. Mix until just combined. Fill each cheesecake pan cavity 3/4 full or roughly 1 and 1/4 medium cookie scoop. Tap pan on counter to release air bubbles. Bake for 15-18 minutes. Cool completely on a wire rack. Transfer to fridge to chill at least 4-6 hours or overnight. Mix whipped cream ingredients until stiff peaks form. Carefully remove cheesecakes from pan, removing pan bottoms. Top off with whipped cream and a mini Oreo cookie. Store cheesecakes chilled.